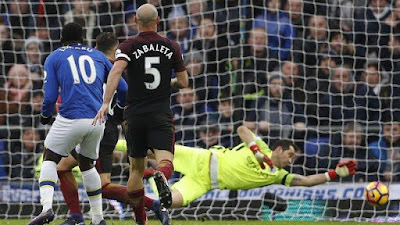 Manchester City are out of the Premier League title race after a 4-0 loss to Everton at Goodison Park, according to manager Pep Guardiola. City are now 10 points behind leaders Chelsea after defeat on Merseyside - the heaviest league loss in Guardiola's managerial career. Asked if the gap was too great, he said: "Yes. Ten is a lot of points." Guardiola, 45, has told his players to unite "in the bad moments" and "forget the table" until the end of the season. He added: "At the end of the season, we our going to evaluate our level and how our performance was, how the coach was, how the players were. After that we are going to decide." The former Barcelona and Bayern Munich boss insisted he was "so happy in Manchester" despite his side sitting fifth, two points behind fourth-placed Arsenal. Guardiola watched City dominate possession on Merseyside but concede four from the six shots they faced. Only five teams have a lower haul than their four clean sheets in the league. BBC Radio 5 live pundit Robbie Savage said City "cannot defend" and questioned if Guardiola would now change his style. City are the only team in the Premier League to have over 50% of possession in every game this season but they have now conceded from the first shot they have faced in four of their last seven games. Guardiola added: "I said to the players be positive because you made some fantastic things during the season and for many reasons we didn't get what I think we deserved. "In the bad moments we have to be close. It's awful for my players. We created chances but don't score and when they have a chance, they punish us." Everton scored with their first two shots through Romelu Lukaku and Kevin Mirallas, with Tom Davies and Ademola Lookman completing the rout. City's next outing is a home encounter with second-placed Tottenham, who are on a run of six league wins.